In 1997 as a college student with mediocre to zero skills in just about anything useful, I was looking for summer work but didn't have anything worthwhile lined up. Forget wanting a to find a job that had anything to do with life skills, I just wanted something that would give me a paycheck so that I could buy gas to drive over to Wendy's parents' house every night. Life was simple back then. As the summer approached, I wasn't having much luck finding seasonal work, but my mom actually gave me a lead on a possible position as an assistant to a contractor friend of hers. Skeptical of the position, and making some $2.00 per hour less than the prior summer, I took the contractor up on his offer and started the week I got home from college. After all, gas was only $0.99 per gallon back then, so I guess I didn't really *need* the extra money. Little did I know that working as his assistant while he performed full scale renovations on beautiful old homes would turn into a lifelong passion for me. Of the many basic skills I learned that summer, most became the building blocks for what eventually allowed me to develop the level of comfort and general aptitude for what we do in our home. Easily one of the most valuable "how tos" he put me through in my four months of working with him came on the day he looked at me and said, "Hey, grab that blow torch!" Wide eyed, I looked at him as if he had made a horrible blunder or just didn't realize what he had said. Surely he meant wrench, hammer, screw driver, sandwich, hamster, or anything more suitable than "this thing that blows really hot fire out of it." Much to my surprise, he hadn't fallen into a bit of tool Tourettes and had intended for me to actually grab the blow torch and propane canister from the tool box. How do I know it was intentional? Because he followed it up with, "I'm going to show you how to sweat a copper plumbing joint." Why, oh why, would he want me to do this critical task in this unsuspecting homeowner's soon-to-be-beautiful bathroom? Didn't he fear I might just burn the whole joint down? Or worse, what if I caused a massive leak? (That's worse, right?) His next response put some of my fears to rest. "Hey, if I can do it a monkey can do it, so that means you can almost absolutely do it." Hmm, impressive logic, can't argue with that. 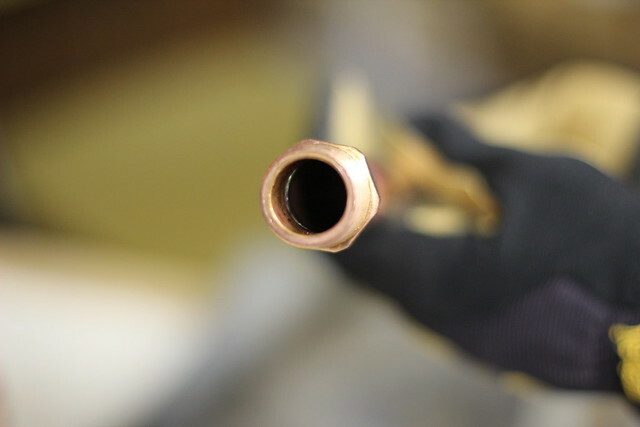 Over the next several minutes he taught me how to make a sound and leak-free copper connection in a plumbing supply line. 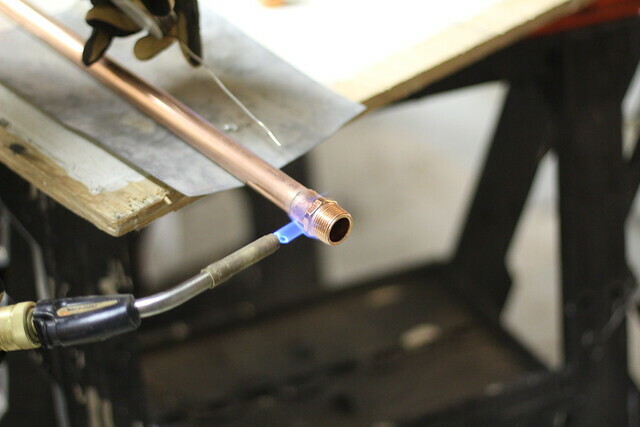 Now that I've been putting these skills to use over the years, I can pass along my tried and true approach to making up a soldered copper connection, or "sweating a copper joint." I know there may be a kajillion how-to web pages on this very topic, but this is the way that I learned, so I wanted to share it with you. The first and most important part of the process is ensuring you have all of the necessary supplies to complete the work. 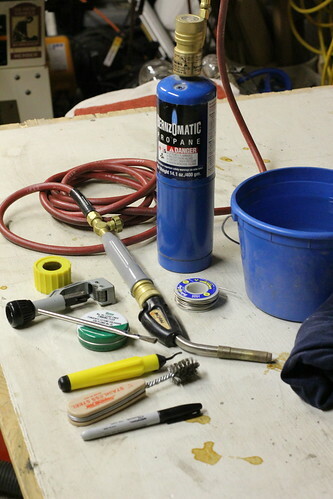 There are quite a few supplies necessary when preparing to solder so you'll want to gather everything ahead of time to make the job easier. 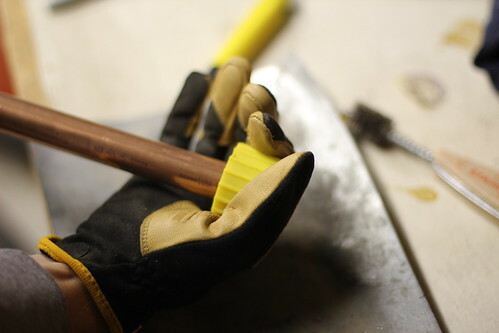 To begin, cut your piece of copper pipe to length using your cutter. I go with the "two rotations for every quarter turn" method of cutting. In other words, I turn the cutting tool's handle one quarter of a turn for every two rotations on the pipe. This keeps the cut nice and even without denting the pipe in the process, a very important aspect of the cut. The cutting process will leave a ridge along the inside of the pipe once you've completed the cut. This is where the deburring tool comes in. 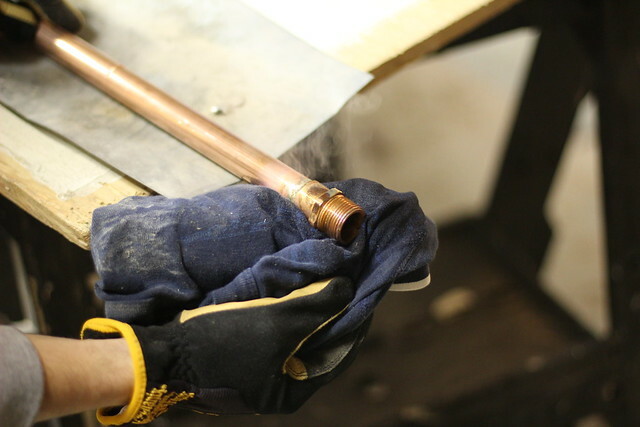 This tool is moved in a circle within the cut length of pipe and takes the ridge left by the copper cutter off of the metal. This is extremely important as the bur will impact the flow of water inside the pipe, potentially resulting in premature failure of your joint or fitting. ...and a wire hand wheel for the pipe. 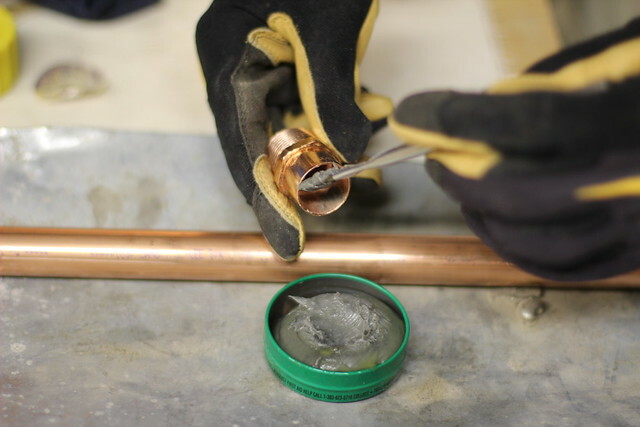 This is a simple process to clean the pipe and fitting, and the end result comparison of the clean versus uncleaned fitting is strikingly obvious. Clean on the right...if not strikingly obvious. 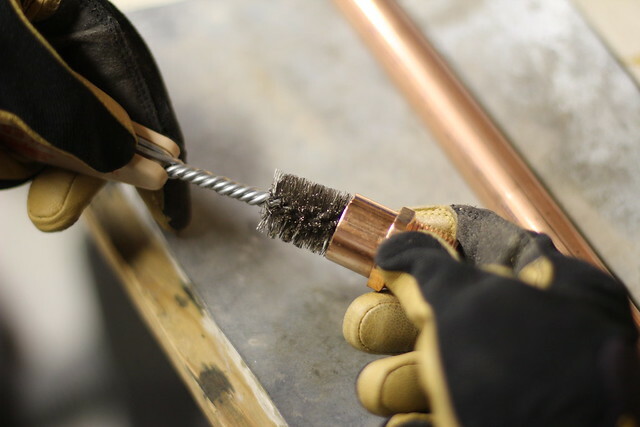 When the pipe and fitting are thoroughly cleaned, just wipe it off with a rag (to remove any dust) and grab your tinning flux. Though the name may imply an alternate function, this has nothing to do with time travel, Deloreans, or Doc Brown. Instead, flux acts to draw the melted solder into the joint once it's heated sufficiently. I prefer the Oatey 95 brand of tinning flux. It's what I've always used and I think it works really well. ...and place the fitting on the pipe, trying to work the flux around in the joint. Finally, grab the propane torch and turn on the gas. My torch has a supply line and ignitor nozzle. I prefer this to the standard fitting as this allows me to work at any angle without worry of more gas heading to the flame than I want. Lighting it is as easy as clicking a button. This also allows me to clamp the propane canister to something else so it doesn't fall over while I'm working.This works well, though I should probably buy one of those little canister caddies that I can carry around. 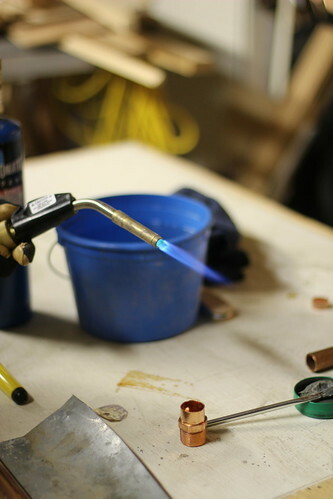 The soldering process only takes about 30 seconds. 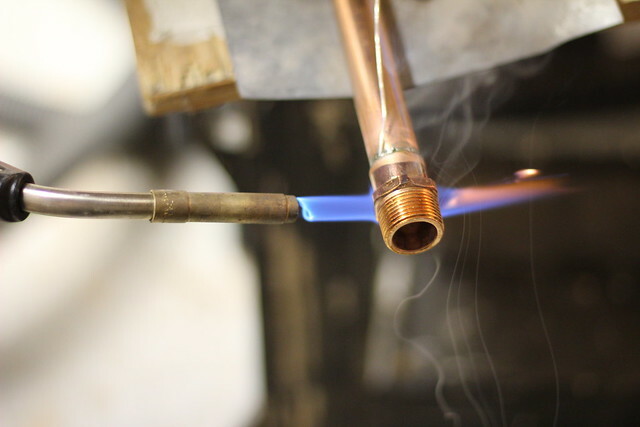 It's best to pre-extend enough solder from the spool so you won't have to deal with it when the flame is lit. 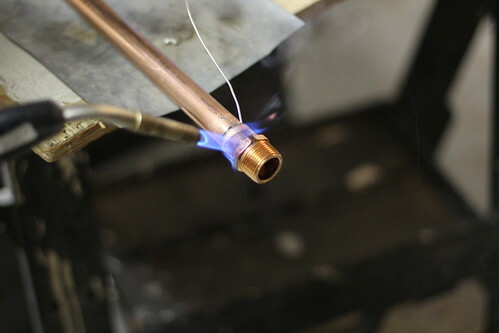 When heating the fitting, it's best to heat the opposite side of the fitting from where you are going to initially apply the solder. 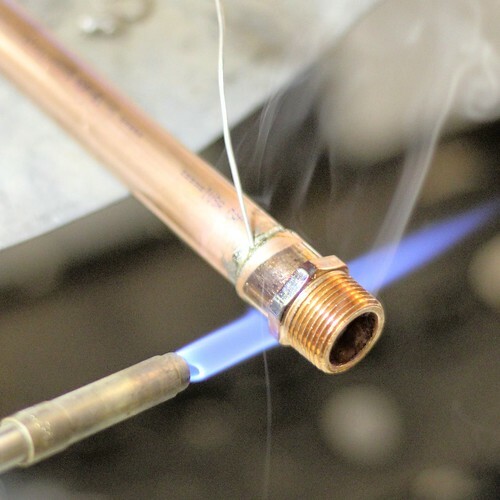 This ensures the whole fitting is heated thoroughly before the solder melts and is sucked into the flux. If the fitting isn't entirely up to temperate it can cause a pinhole leak in your joint. 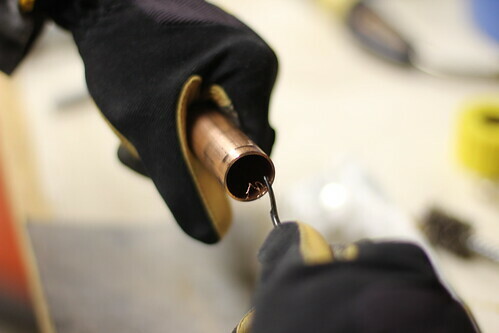 It's also best to apply the solder to several points around the joint to ensure full coverage. Just keep the flame on the joint (moving around the joint if you'd like) the whole time so it doesn't begin to cool during the process. Once the fitting reaches temperate, the tinning flux will begin to change color and smooth out, then the solder will melt and will be visibly sucked into the joint. This ensures a solid and secure bond throughout the connection. When the solder has been applied and everything looks good, turn off the flame and gas and wipe the solder from the joint with a rag before it cools. Follow this up with a wet rag dipped in the nearby water to cool and quench the fitting. 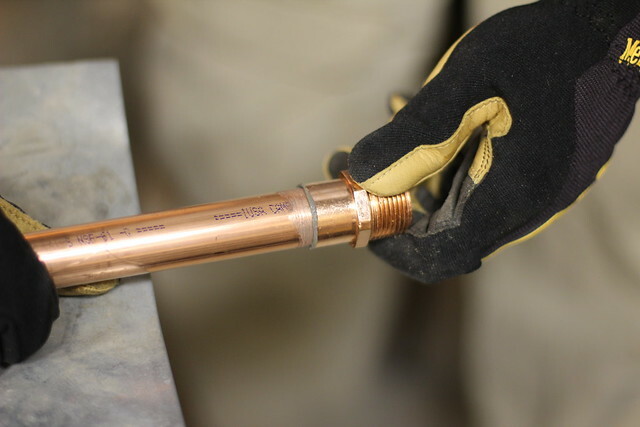 After allowing the fitting and joint to fully cool for several minutes, you will need to test your connection. What you do next is actually the single most important aspect of the whole process, so it's important you follow this step. When you turn on your water to bring your pipe up to pressure, and you inspect the fitting to ensure no leaks, repeat aloud "No drips, no runs, no errors." If you fail to say this the odds that this or a future fitting will leak increase by 73%. This is a proven fact, there's no arguing it, sorry. When sweating a smaller fitting, like the one I was working on, you can actually look through the end to see that the solder has been pulled through from one end right to the other, all thanks to the flux. This is evident from the telltale silver on the interior of the pipe and fitting. 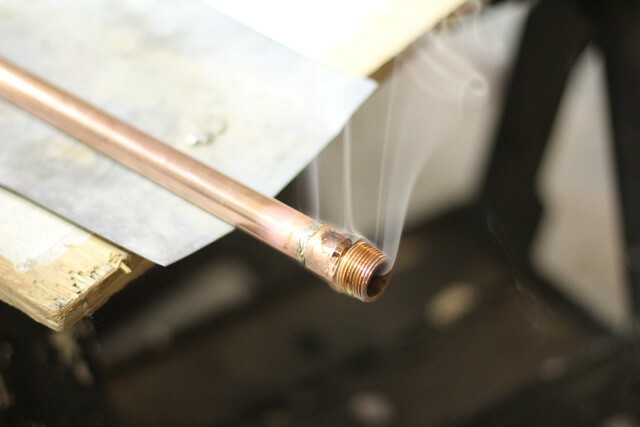 Though the process is called sweating because you heat the pipe and fitting until it starts to "sweat," I can actually attest that it's also because of the tremendous amount of pressure I felt when first trying this approach, and how much it made me sweat. All in all, it's a straightforward means for installing copper supply lines, and there's little overall risk if you take the proper safety precautions (primarily to wear gloves and goggles, protect wood from direct contact with the flame by using metal, keep water nearby, and treat the torch with great care and caution). I hope you find this little story and tutorial useful and that it might inspire you to give it a try if you've never soldered before, or even help you pick up a trick or two for making this process easier. Did you ever have any good high school or college jobs that provided you with long lasting information that you've been able to use throughout the rest of your life? Did you ever do any work for a contractor? Learn any great tricks? I'd love to hear all about it. This is a fine skill to have, and one that really isn't all that hard to learn, as you said ... though the torch is a bit scary at first. Twilight Zone time again! Here you are instructing us on how to sweat pipe fittings, just as I had a plumber in my basement, laying on his stomach, working head down in a hole, repairing a leak in our water main. Unfortunately, there is another leak somewhere outside next to the house, so breaking of concrete and digging out there will commence first thing tomorrow morning. Ugh, no thanks on a water main leak! Good luck with the fix. You know what made me far less hesitant of the torch? Changing over from the strike style torch lighting to the button. Now it's just super easy. Good lesson. I've never seen anyone use a flexible hose before. Smart idea. 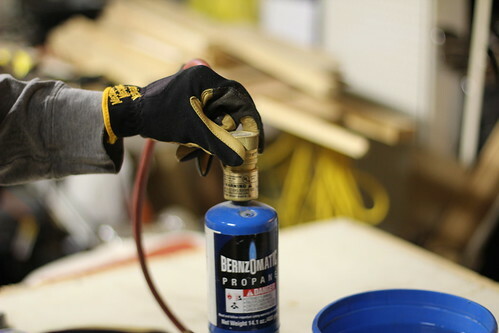 I usually use MAPP gas since it burns a bit hotter. I've always had better luck with it over propane. When I was working that summer I used MAPP, but since I don't really solder all that often, I'm okay with the additional time needed for the propane. The MAPP sure can knock out a fitting in just a few seconds. I'll do a little toolbox tuesday on the flexible hose. There are several options out there, and it makes a HUGE difference in control and tight area access. Nice tutorial. The only things I would add would be: don't go overboard with the flux, and make sure to clean the pipe carefully after your joints are done. The flux is actually an acid that cleans the metal (for the tin/lead to bond better), and if it's not completely cleaned off, you will later end up with those cruddy blue green verdigris corrosion spots around all the fittings. What I find a bit sad is that this is already starting to become a dying craft. 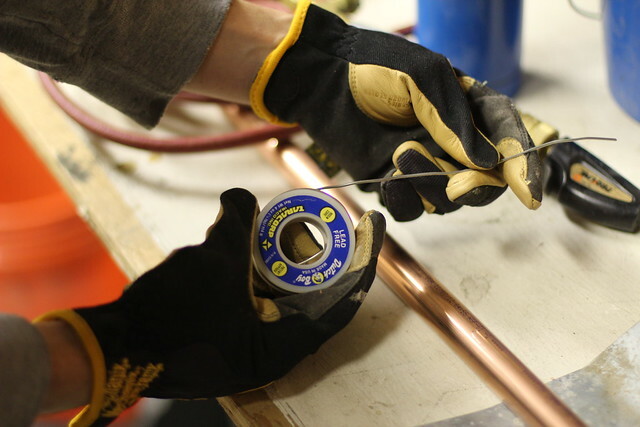 These days, everyone is going over to products like Pex (which I don't really like as much), and quick-connect fixtures like Shark Bite fittings. I was really disappointed when I found out that my dad paid through the nose to have some plumbing done on our old house, and they did the new part with Pex. 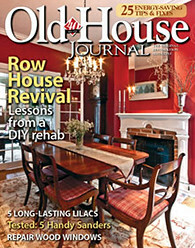 I could have easily done the copper for him, since all the rest of the house was redone in copper many years back. I can't quite say why I don't like the Pex. There's just something I don't trust about a product that looks like a garden hose for home plumbing. It hasn't been around that long, and who knows how long it will really last. HAH! I think you and I need to sit on a front porch in rocking chairs, drinking beers, and swearing about how "people just aren't doing things the way they used to!" I'm actually on the fence on Pex. I don't like the sharkbite fittings, etc. The only pex I'd use is the Uponor brand with ProPex brass fittings. I really don't trust the plastic fittings. I'm far more skeptical of that over the tubing. I think pex has its place, but like you said, who knows how long it will actually last. I guess we'll see. Good point on the removal of the excess flux. Another thing that I really like about the copper, is that you can easily UNSOLDER it, and reassemble it (which I've done without any problems), which is not true with some other modern products (like ABS). I have used a few of the shark bite fittings simply for convenience. These are fun because they can be uncoupled (or am I thinking of another fitting?) Nope, sorry the ones I used are the "push connect". You need a special tool to uncouple them, but they are non-permanent. I used these on my hot water tank, and on the shower fittings. Everywhere else is soldered copper with shut-off valves. I hope and trust that you're not using lead / tin solder. 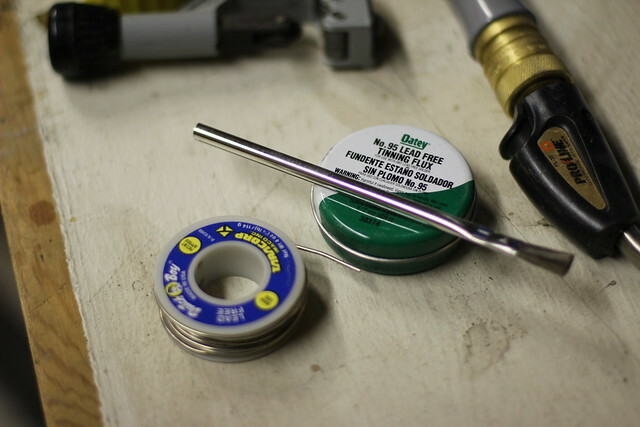 Safe solder no longer uses lead at all. One of the alloys is tin / antimony. Otherwise good points. I've used Shark Bite fittings and have no problem with them. Unfortunately, I can't say the same for the use of soldered joints, although I agree they seem more permanent. I don't often do plumbing projects, so I'll probably use Shark Bites today. This is a very useful skill to have. 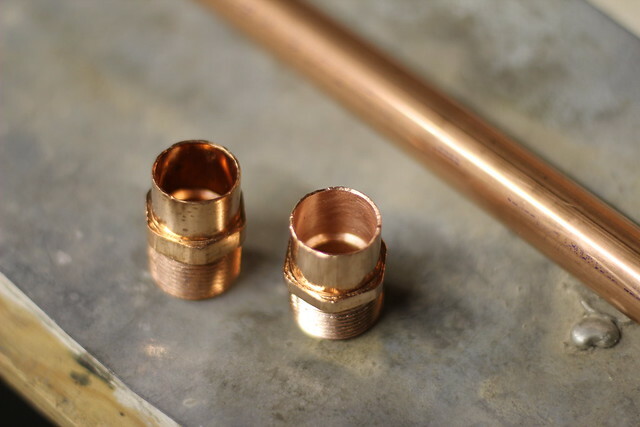 It's saved us a ton of money to be able to do it ourselves, especially with the price of 3/4" copper pipe being about $30 per 10 ft length now. 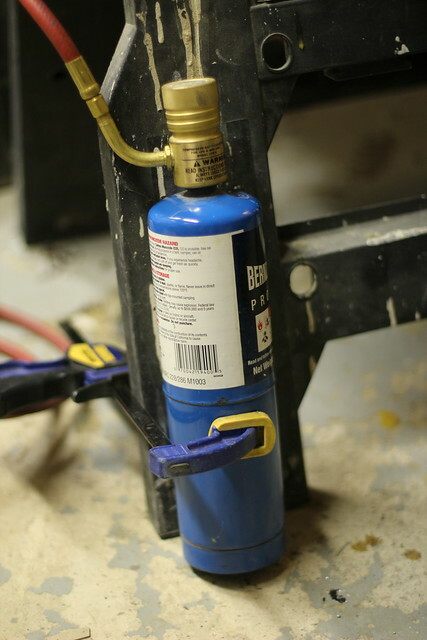 I use MAPP gas for soldering, but it's a personal preference. One thing you may want to add - a good fireproof panel is your best friend if you have to solder inside of a wall. My old boss said "every fitting you can solder yourself in your house will save you about $20-$30, so get good at it, ok?" It was quite sage advice, that's for sure. I've used the metal as the flame blocker but I do need to buy one of the blankets. I find the metal is easier to prop in place without the risk of it falling into the heated pipe. Actually, I'm going to go order a new fire extinguisher and torch blanket right now while I'm thinking about it. Thanks! This was one of the 1st skills I learned after buying my old house. If in soldering near anything wood I wet it down if possible with my garden sprayer. I've never used the MAPP guess and I'm a little reluctant too because of how hot it burns. I'm afraid it would be easier to catch something on fire. I actually have a scar from my 1st soldering experience, which taught me 2 valuable lessons. 1 wear long sleeves. 2 Open a faucet/valve to relieve pressure if possible. I didn't follow this advice and had a piece of bread covering in molten flux shoot out of the pipe and land on my arm once the pressure in the isolated pipe built up... good times. With on the contrary four dead so extreme, definitely is amazing and I'm looking back to the final release.